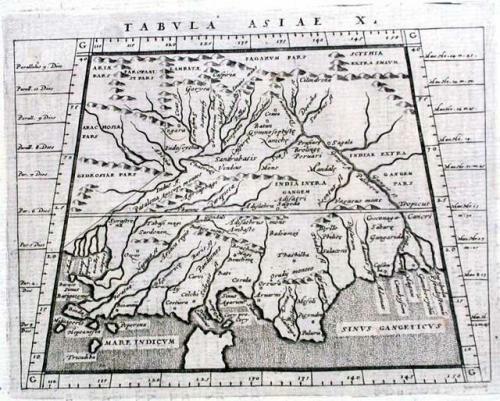 Title: Tabula Asiae X. Publication: Geographiae universae tum veteris, tum novae absolutissimum opus... Auctore eodem Io. Anto. Magino Patavino..., Cologne 1597, Petrus Keschedt. A Ptolemaic map of India and of Sri Lanka (Ceylon). The sub-continent is considerably foreshortened with the rivers Indus and Ganges as the only recognisable features. The Based on the 1561 Valgrisi edition. Text on verso.